Are you looking for similar solutions? Leave a contact and we will answer. 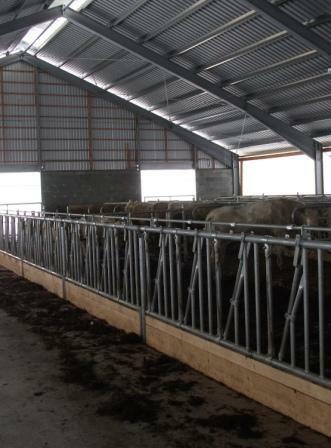 Building is designed to house cattle. The main structure is made of wood with glued trusses. Livestock housing is in individual pens strewn with straw with reinforced exterior enclosures. Feeding is performed on a partially sheltered feeding table. 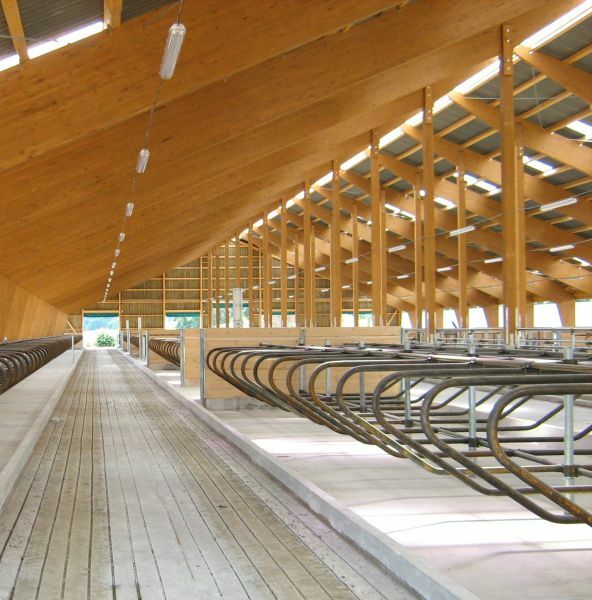 It is a modern slatted barn with flooding channels designed for cows. 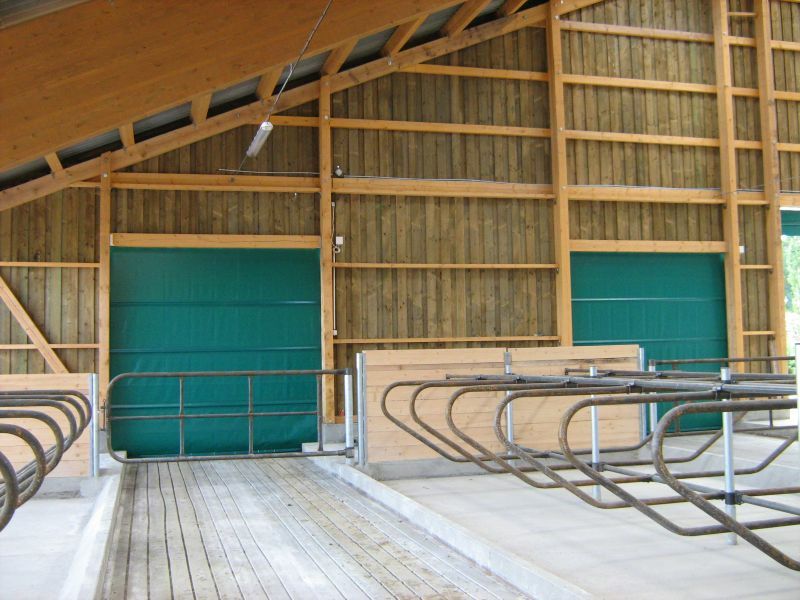 Stables are designed as a single hall with the main structure made of steel. Roof cladding is made of sandwich panels with polyurethane filling. 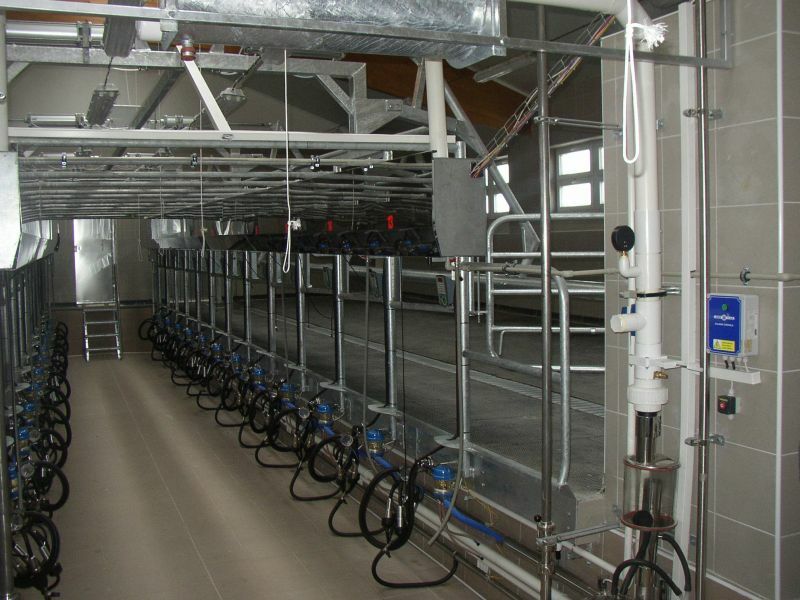 Milking parlour is designed as a parallel 2x16. Livestock housing is without litter, with mattresses and residues from the manure, which is then pumped into an outside storage tank. 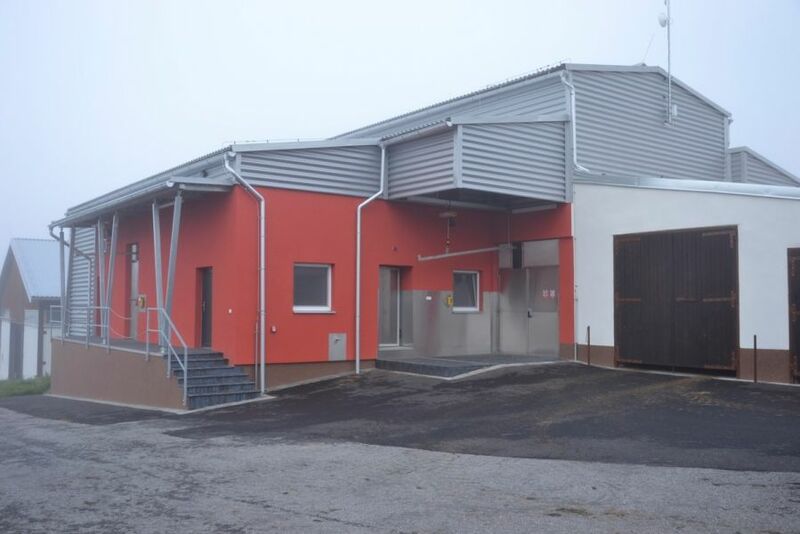 Stable for ZD Nečin is with stabling capacity ca 290 pcs of dairy cows. Main bearing structure is wooden with glued ties. 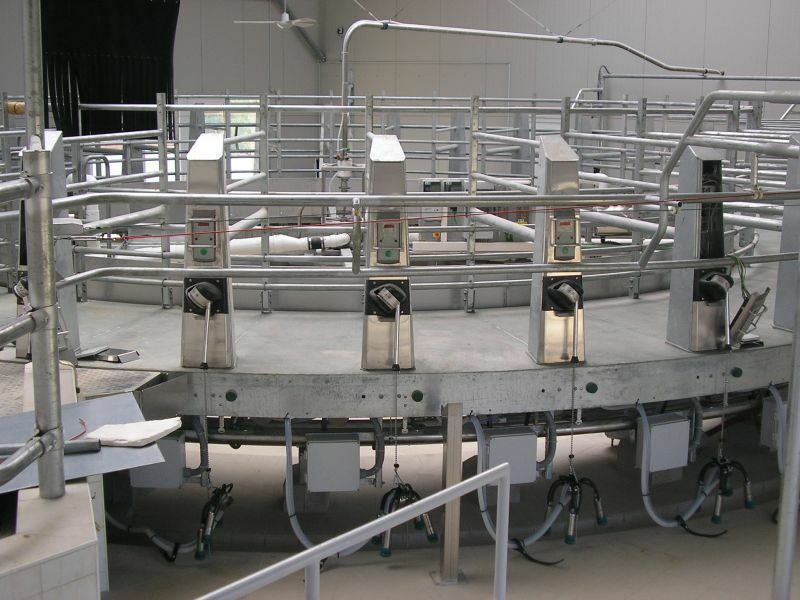 Part of the delivery is milking technology, where in this case was used unconventional type of milking parlor RD 8 x7 x5 (so-called trigon milking parlor). Stabling of dairy cows is made in a lie down boxes strewed with straw. Manure is carried away to outdoor dung-yard. 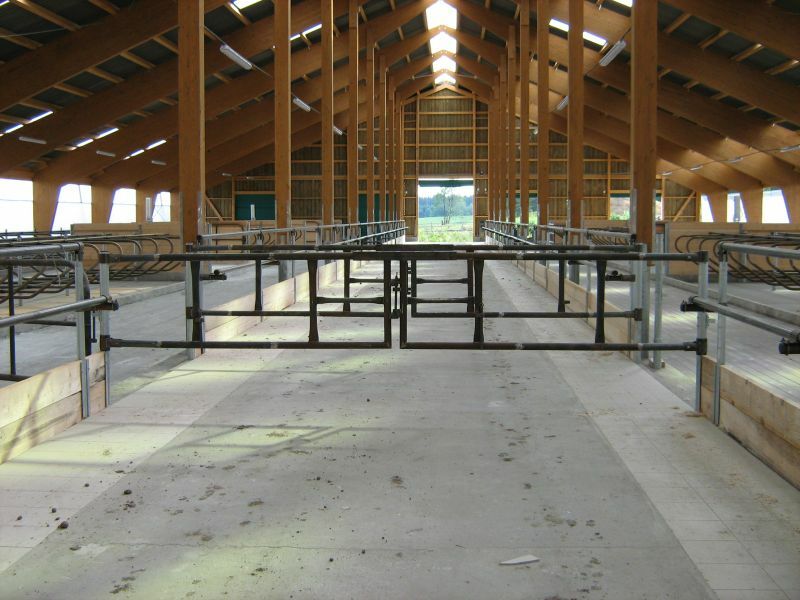 This new modern stable is intended for ca 318 pcs of dairy cows. 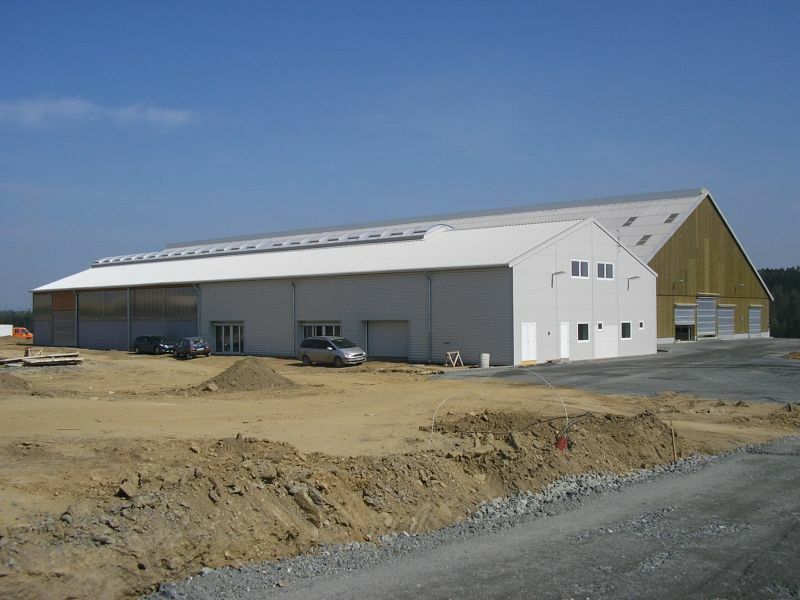 It is a single-aisle hall with dimensions 33 x 82 m. Main bearing structure is combination of wooden glued ties and bearing supporting steel columns. Stabling of dairy cows is made in a pens strewed with straw. Part of the delivery is also new building of milking parlor RD 2 ?~ 12 quick departure with flow meters Afi-Lite and identification and reconstruction of stable for ca 158 pcs of productive dry standing cows in delivery phase. In this building is strewn operation as well. Manure from both stables is scraped with help of tractor into the two new reconstructed covered dung pits, which are equipped with retaining reinforced concrete walls. This building is built on the original site of the stables “Fidlot“. The used design is very popular in the past few years. The main structure is a combination of wood glued trusses and supporting steel columns. Cladding panels are concrete and they are connected with 2m high vent covers. Livestock housing is designed in individual pens strewn with straw. 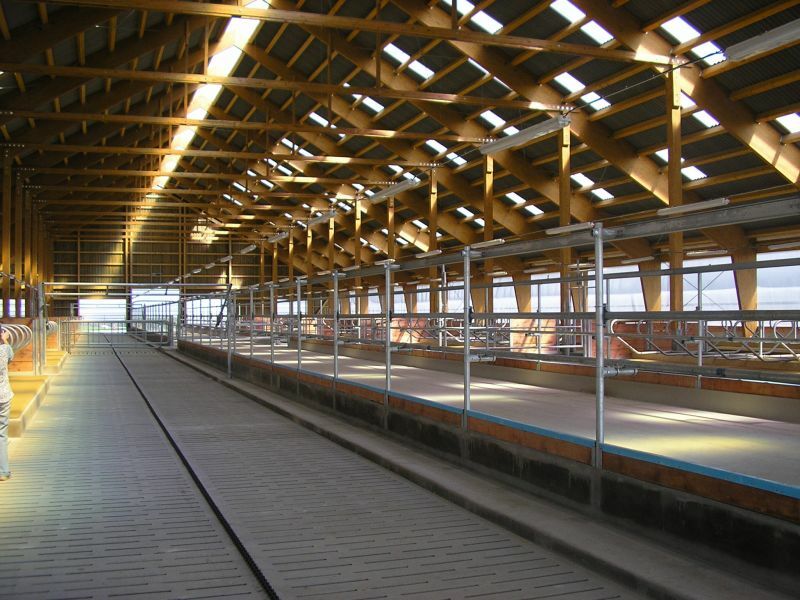 It is a modern slatted barn with flooding channels designed for cows. The main structure is wooden with glued trusses. Part of the agreement was also the installation of the latest rotary parlour with 36 seats. Livestock housing is in the separate boxes with mattresses and residues from the manure, which is pumped to a storage tank. 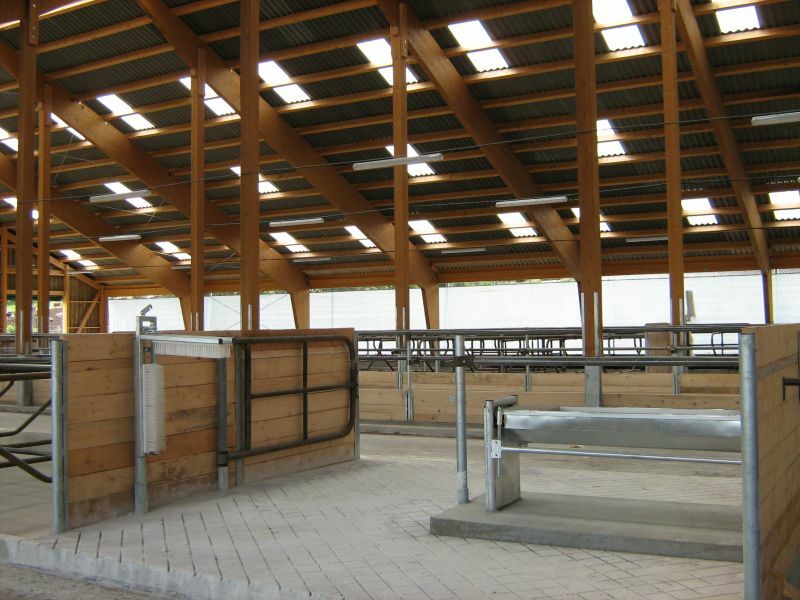 It is a very modern stables for milch cattle. The main structure is a combination of wood glued trusses and supporting steel columns. 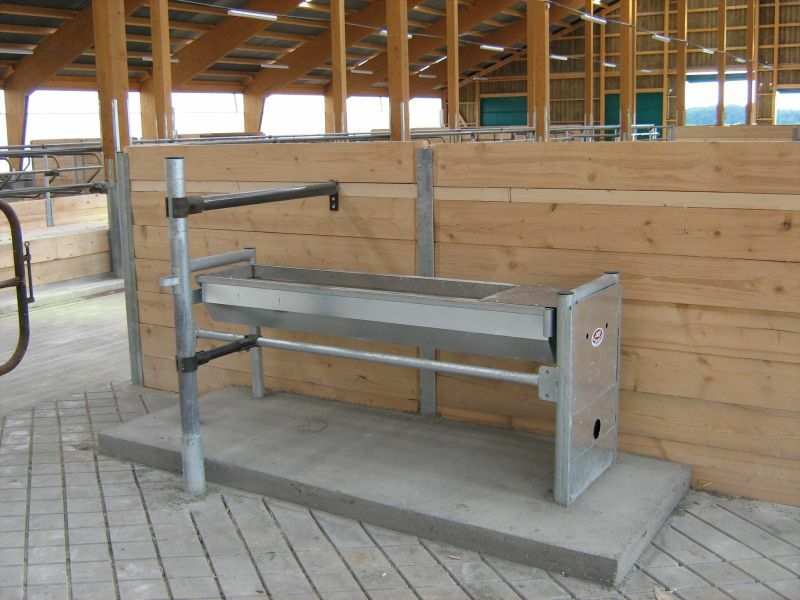 Livestock housing is without litter, in separate boxes and with mattresses. The manure is weighed using a mechanical manipulator into pumping tank then to the concrete outdoor storage tank, that is partly recessed. Technological part includes three submersible mixers and a pump for removal. 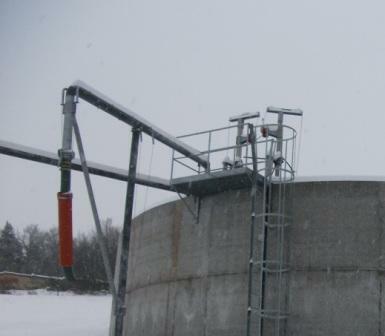 Circular concrete storage tank has a storage capacity of their 6-month manure. 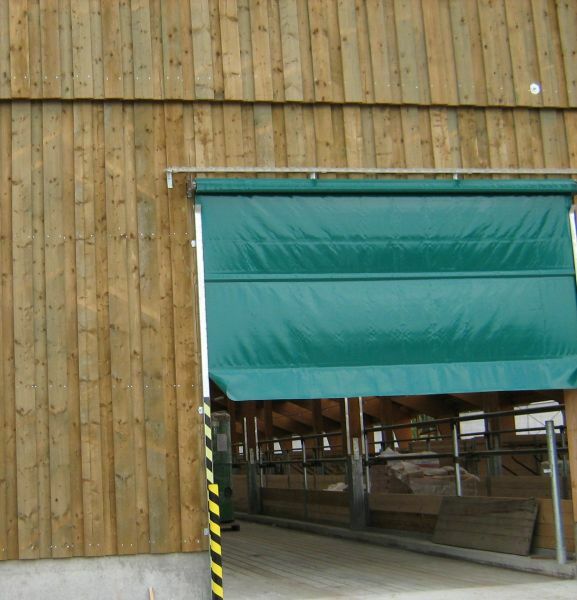 It is a very modern stables for dairy cows. The main structure is a combination of wood glued trusses and supporting steel columns. 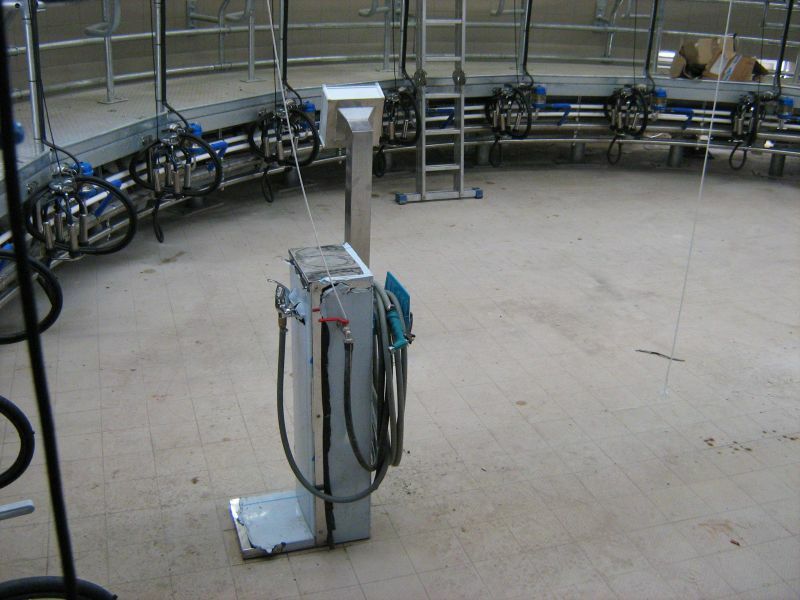 Part of the agreement is also supply of the RD 2x12 parlour with dovetail arrangement and Afi-Lite flow with identification. Livestock housing is in separate boxes with mattresses. Manure is weighed by hydraulic shovels into the center channel from where it is pumped through the separator to outdoor storage tanks. The main structure is framed with steel welding rods. Livestock housing is designed in individual pens strewn with straw. Pens are zinc coated. The manure from the barn is weighed using a mechanical manipulator to outdoor midden. Feeding calves is secured using a mobile truck for milk pasteurization. You may find more information about the inaugaration here. VOD Avena expands its production for biogas station, thereby they ensured stable financial earnings thanks to steady purchase prices, and diversified hazards from their productive activity. Part of the delivery are fermenting device, end fermenting device and turn-around point with usable volume 2 285–6 032 m3 respectively. All containers are covered with the gasholder with the total volume 3 365 m3, this is capacity for clearing the biogas from sulfur, with our technology is lower than 40 ppm. This capacity of gasholders ensures distinctively lower service of cogenerating unit. Electricity is supplied into ČEZ distribution network, waste heat from cogenerating unit GE Jenbacher is used for heating. 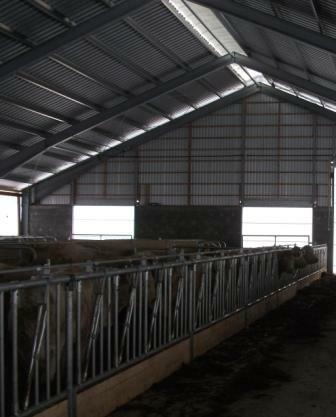 New stable building for young cattle rearing is intended for ca 80 pcs of young bullocks. Hall dimensions are 63 x 22 m. Bearing structure is combination of wooden glued ties and bearing supporting steel columns with hot-dip galvanized coating. Stabling of cattle is here made in an individual lie down boxes strewed with straw. 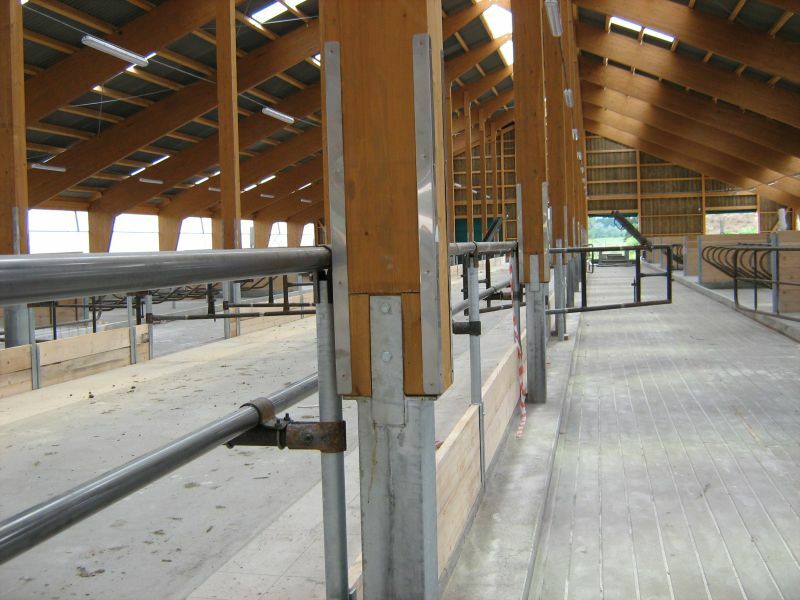 This new modern stable for ZOD Maj is intended for ca 426 pcs of dairy cows. It is single-aisle hall with dimensions 32,5x106 m and there was used main bearing steel construction without internal columns. 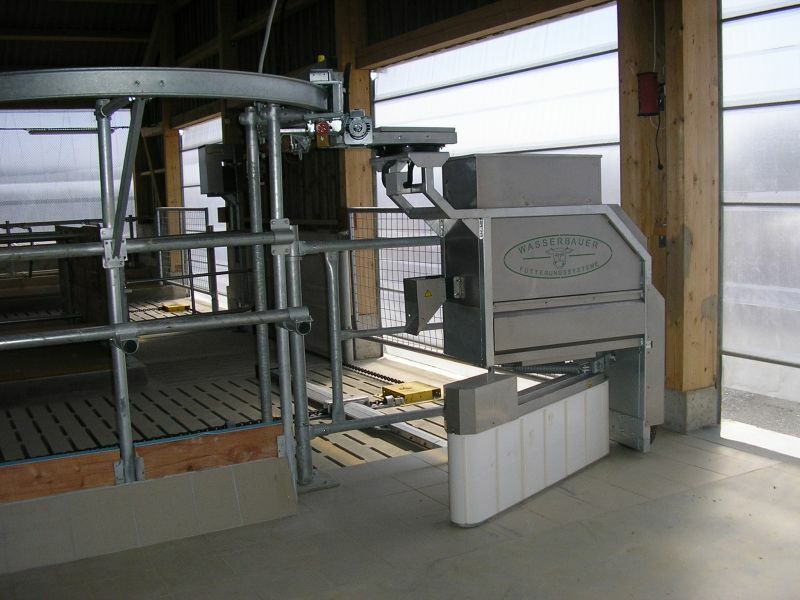 Part of the project is delivery of milking technology for milking parlor as well - herringbone type 2 x 12 quick departure. Cattle stabling is in lie down boxes with mattresses. Slurry is delivered with help of hydraulic shovels into storage pits. shovels delivered into outdoor lagoon. 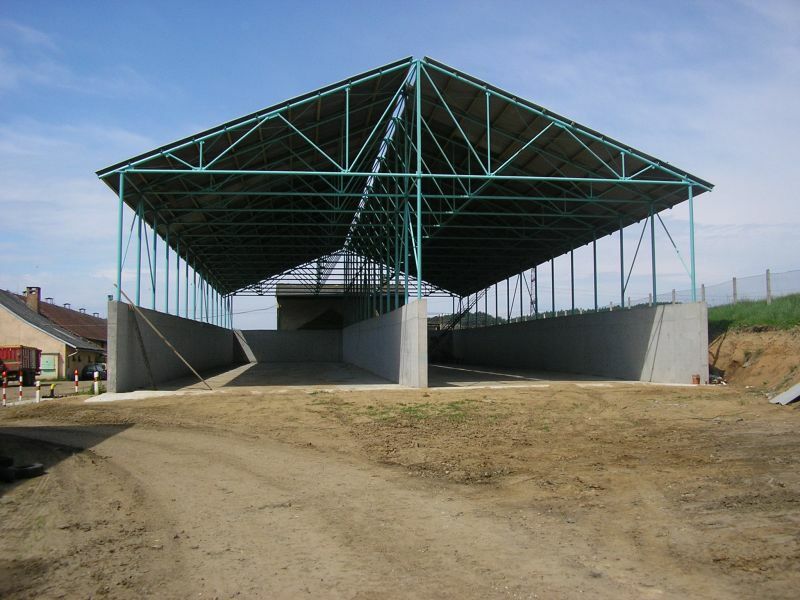 Realization of two new stables with dimensions 32,5 x 84m and with capacity 2 x 320 pcs of dairy cows. Main bearing structures are wooden with glued ties. Part of the project was delivery of milking technology for milking parlor KD24 (circular milking parlor) as well. Stabling of dairy cows is made in a lie down boxes strewed with straw. Manure is scraped into outdoor dung pit.